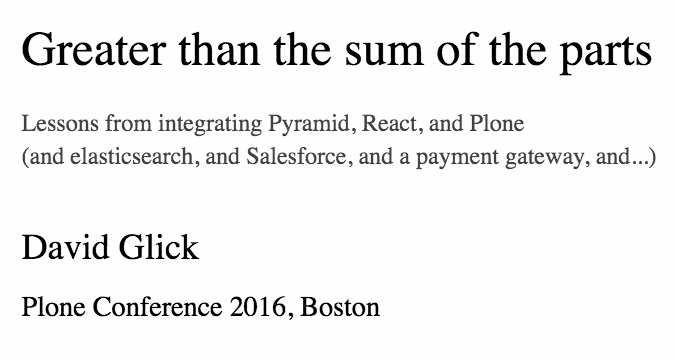 Lessons from integrating Pyramid, React, and Plone (and elasticsearch, and Salesforce, and a payment gateway, and...) As told by David at the 2016 Plone Conference. Jazkarta built the Volunteer Management System (VMS) for the Washington Trails Association to manage volunteer sign-ups for trail maintenance. It allows staff to schedule work parties, volunteers to find and register for them, crew leaders to access information about their crew, and land managers to report on work that was done in their region. This tool is a critical technology piece for WTA. In 2016 they had 150,000 trail maintenance volunteer hours done by 4,700 volunteers on 240 trails across the state. That equals 624+ months or an astonishing $3.9 million dollars worth of labor donated to public lands. His opinions about Pyramid, the so-called unopinionated framework, why Pyramid rocks for this type of project and some of the choices we made. Techniques for making a Pyramid app work alongside a Plone website as one seamless website from the user's perspective. Watch a video of this talk on YouTube.